Take a couple minutes to think about the questions below then share your answers with your partner and explain the reasons behind them. 1. How would you describe the inner feelings that you had on the trust walk? 2. How did these feelings change when there was only verbal contact? 3. What was the most significant moment for you during your blind walk? 4. What did you discover about yourself during this time? 5. How would you describe your partner if your only experience with him was the trust walk? 6. What experiences out of your past did this blind walk bring to mind? Trust: The Ultimate Test Second Edition is a powerful tool for helping facilitators explore this sensitive issue — without arousing defensiveness. There simply is no other product like it available today. Through Trust’s 24-item assessment and its insight on the dimensions of trust-related behaviors, participants find a deeper understanding of trust, which they can apply to their individual, team, and organizational relationships. One or more low-trust relationships are hurting an entire team's productivity. You want to provide intensive, one-on-one coaching for leaders. Two peers need to address the issue of trust in their relationship. You want to assess readiness for alternative work arrangements, such as telecommuting. The instrument is effective when used as a stand-alone instrument as well as a component of a larger training program. Research proves it. The “best companies to work for” are more productive and more profitable than their stock market peers. But a great workplace is not something that can be achieved in a quarter, or even a year. For a great workplace to exist, employees must trust the organization implicitly, take pride in what they do, and be inspired to achieve superior performance. And that requires a different breed of leadership—leaders who know how to instill and reinforce these beliefs in every communication, every decision, and every interaction. It requires leaders who realize that how they do what they do makes a world of difference to employees. The Great Workplace: Building Trust and Inspiring Performance is a combination assessment and workshop that’s designed to increase employee productivity and boost performance. 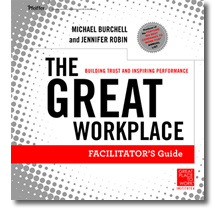 Based on more than 25 years of research conducted at the Great Place to Work Institute®—the producers of the FORTUNE 100 Best Companies to Work For Annual List—this training package is packed with accessible and indispensable ideas, inspiration, and actionable plans for creating great workplaces. Learning Outcomes Examine the essential elements of a Great Place to Work®, including trust and communication Develop an understanding of the key role managers play in building a great workplace Identify opportunities and generate ideas for making realistic changes Acquire a framework and tools that can be used to make a positive impact in the workplace How It Works The Great Workplace training package offers a flexible half-day to full-day of training that includes an interactive mix of self assessment, small group exercises, case studies, and large group discussion. The program is designed for front-line managers who have daily interactions with employees. Human resources professionals will also find the content useful in designing policies and practices that maximize trust-building in the organization. Michael Burchell, EdD Dr. Michael Bruchell is a corporate vice president with the Great Place to Work Institute and a partner in the Institute's UAE affiliate. A sought-after speaker at conferences around the world, he has worked with senior leaders in positioning the workplace as a competitive business advantage. Jennifer Robin, PhD Dr. Jennifer Robin is a research fellow at the Great Place to Work Institute. A former consultant with the Institute, she currently teaches in undergraduate, master's, and professional programs at Bradley University. The Great Place to Work Institute is a global research and consulting firm with forty affiliates around the world. The Institute produces the FORTUNE 100 Best Companies to Work For Annual List and the Best Small & Medium Companies to Work For in America lists, in addition to 38 best companies lists internationally. Find out more at HRDQ.